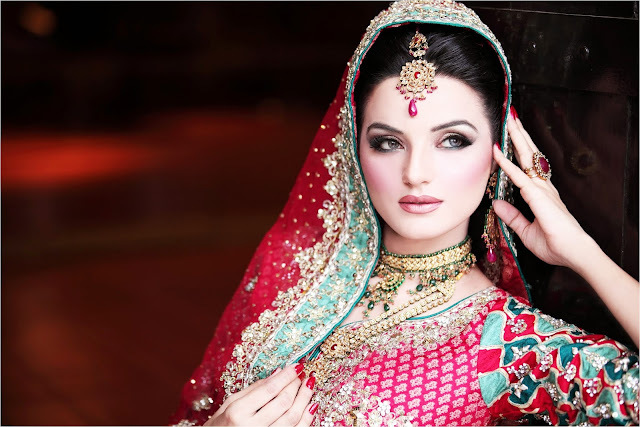 The wedding is one of the special occasion in every woman's life. She wants to look like a diva from every angle. We often see how every bride, before walking down the aisle, hires a makeup artist. If you are lucky enough to get hold of a professional artist who really knows the trade, the scenario is different for you but sometimes women end up looking ghastly on their wedding photos due to wrong makeup products. No one would know your skin and features perfectly than yourself. Unless you haven't touched cosmetics in your whole life, you would know what shades suit you and which colors match your complexion. 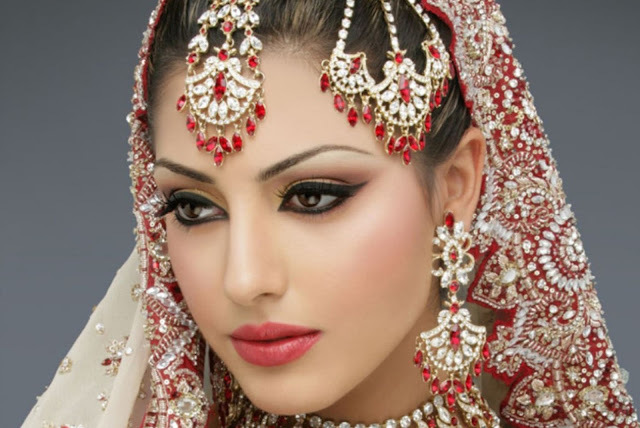 Doing your bridal makeup will not only save you a lot of money but also gives you the satisfaction of the look. Always look for products with "long-lasting" and "waterproof" variants to avoid any touch ups. Even if it may seem slightly challenging, read on to know how easily you can smoothen the things for the wedding day makeup. 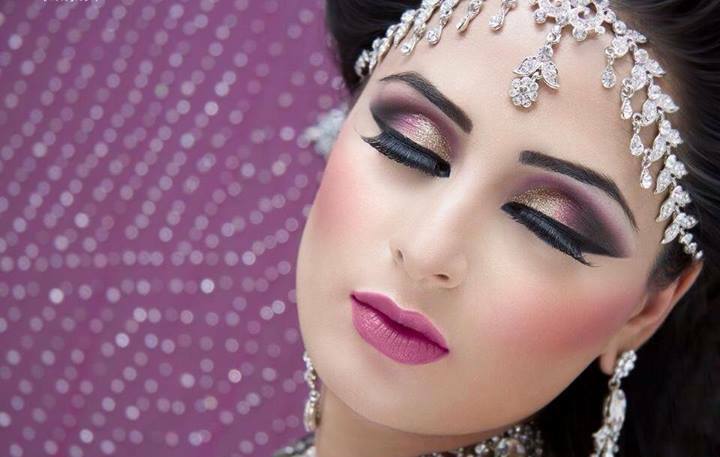 Always start with the eye makeup, followed by the face and then finish your look with the lip makeup. Prime & Conceal The Eyelids: Always use a good primer or eye cream before starting the eye makeup. If your eyelids have the habit of creasing, make sure you settle the issue with a good base and powder. For concealing the dark circles and puffy bags, use a peach or orange color corrector according to your complexion followed by a highlighting concealer. Eyeshadow: For the wedding, chose colors like golden, berry plum, olive green or the basic bronze which will look good on your eyes. If you have small eyes, make them look bigger with a smoky look or darkening the outer V. Make sure you invest in a good blending brush without which the whole look will go to waste. Blend the colors as much as you can to look natural up to the crease line. Eyelashes & Eyebrows: For the wedding, it is advisable to go for falsies but make sure you do few trials before wearing them on the wedding day. Before applying the falsies, curl up your natural lashes and apply a single coat of mascara. Then, apply the falsies carefully followed by the eyeliner to correct the mistakes. Never ignore the eyebrows which play an important role in your makeup. Fill them up with a nice grey/brown color followed by the brow gel. You can also substitute this with a light brown eyeshadow. Moisturize & Prepare The Skin Well Enough: Make sure you are eating right and healthy foods prior a month of wedding and not to mention, the essential skincare required for the type of skin you have. Before you begin your makeup, thoroughly cleanse and tone the skin to minimize the pores as possible. Begin with a moisturizer to hydrate and nourish the skin which will be the ultimate base. Follow this with a primer which will further smoothen the skin and make it ready for the following makeup products. It is very important to keep in mind the season you are getting married to use the right kind of products for the skin. Foundation & Concealer: From dark circles to discolored patches and pigmentation around the mouth, everything needs to be concealed to make you look flawless. To cover the blemishes correctly, use various color correctors like yellow, peach, orange, blue followed by the corrector shade of concealer. For the wedding, try and use the highlighting concealers which will give you a certain radiant touch on the concerned areas instead of looking ashy. Choosing a foundation isn't a cakewalk. If you are not sure of the right shade, do a full face trial before buying the foundation and see how it looks like under natural light. For blending the foundation, use small amounts at a time with a damp brush and a sponge which will help you blend seamlessly giving the coverage. Highlighting & Contouring: Apply a matte bronzer on the hollow under your cheekbones and also line the nose which will give a slight upliftment. Line your jaws as well with bronzer for a proper contouring and blend it with a soft brush. Use an illuminating highlighter on the cheekbones to give a nice glow which will turn out good in the pictures. Always apply the blush after you have applied the lip color and eye makeup to compliment the look. This will ensure that you are not applying too much color on the cheeks which may turn out too loud and artificial. Setting The Face Makeup: Doing the makeup isn't everything, and you have to make sure that the look should last for the whole day. With a fluffy brush, apply the HD translucent powder on the T-zone to eliminate the excess shine which will not look very flattering. After everything is done, use a good setting spray which will keep your makeup fresh, dewy and natural for the whole day. The primary concern is to eradicate any kind of dry and flaky skin on the lips. For this purpose make sure you apply a thick coating of lip balm on the previous night and exfoliate them well enough the next day followed by a layer a lip balm. 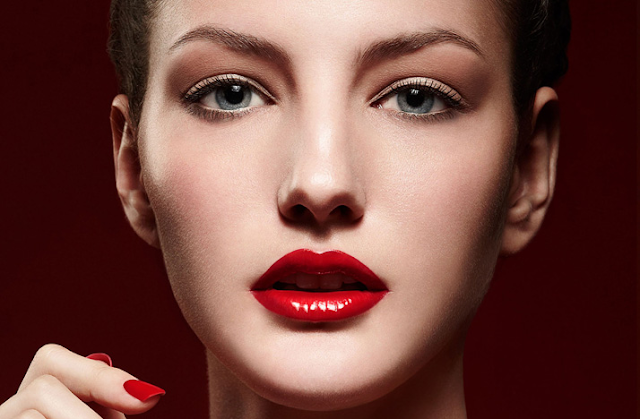 You can choose any bright lip color of your choice – red, plum, pink but always go for the right undertones. If you are warm toned, cool undertones won't suit you or vice versa. Start by lining the lips with a neutral color or a similar color of the lipstick. Now apply the lipstick, blot it with a thin tissue and apply another layer. This will ensure that your lipstick will last for a long time. For the wedding, neither go for too glossy nor too matte – try and choose a satin velvety texture which will look good in photos. 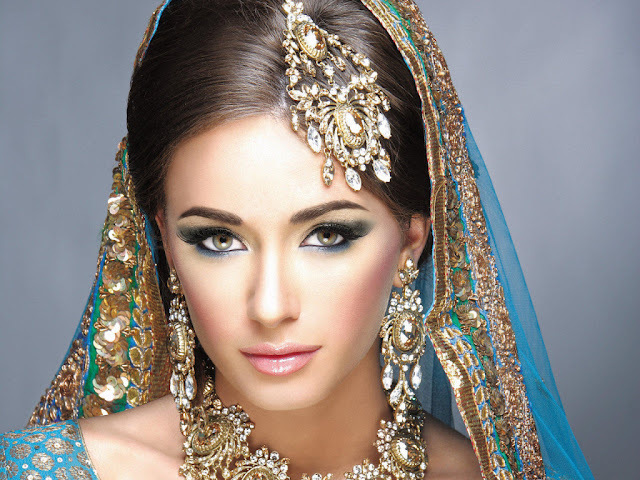 To be extremely confident, you can do a trial makeup for the whole look few days before the wedding. This will ensure that you are using the correct makeup products and also to be on the safe side to get the right wedding look. Click few pictures from your cellphone as well as a DSLR. This will make sure you are using a right foundation which looks naturally flawless in photographs rather than a white ashy cast on the skin. Keep more than enough time if you are going to do your makeup yourself. Never hurry as small mistake you make can ruin the whole look. To learn like a pro in applying makeup, take the help of internet and teach yourself the tricks and techniques of makeup artists from the comfort of your home. Useful tips for all the brides to be! This is indeed a very informative post. I always wonder if I can do it all by myself on my big day, perfection is what that matters on such occasions. All you need a bit of practice that's it. No one knows your skin better.. Doing makeup for D-day seems like the most scariest task as even a little mistake can ruin the makeup and mood!